The Master Valuer program in jewelry appraisal studies was the only widely available course of its type when developed and introduced by Anna Miller. Up until its debut, appraisal education was restricted to offerings by private appraisal organizations. Though Anna Miller passed away early in 2003, her legacy of high-quality education through the Master Valuer program will continue. The Master Valuer Program is taught in many countries, including Canada, England, Sweden, Korea, Hong Kong, China and Singapore. It has also been translated into French, Korean and Chinese. In the United States, the Master Valuer Program will now be taught exclusively through the California Institute of Jewelry Training in Sacramento--both in residence and through distance education. Anna Miller's books continue to remain popular classics with aspiring and experienced jewelry appraisers alike. Now is 3rd and 4th editions, the industry depends stongly on her works and the MasterValuer™ course. We keep everyone informed of periodic updates and news concerning the MV program. 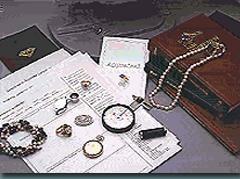 We invite all Master Valuer graduates to provide us with their current contact information. The Master Valuer program residence classes and workshops will be conducted at the California Institute of Jewelry Training and Vancouver, Canada. Additional international classes are offered in Korea, Hong Kong, Sweden and China. The MasterValuer™ jewelry appraisal program does not support jewelry appraisals that claim gemstones or jewelry to be sold for the purpose of investment? This is not to say that said appraiser is not qualified or capable of appraising properly; it is to say that it is the opinion of MasterValuer™ International that a larger percentage of this type "investment" gemstone is commonly questionable and we as an organization of jewelry appraisal professionals do not support this practice.